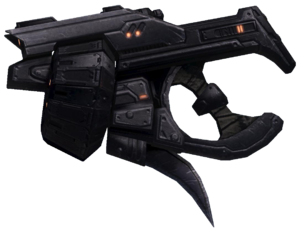 The Type-52 Pistol (T-52 P), more commonly known as the "Mauler" is a sidearm used by the Jiralhanae military forces of the Covenant during the Human-Covenant War. Another view of the Mauler. The Type-52 Mauler is used by the Jiralhanae as a handgun, although human military experts have classified it as being more of a handheld shotgun than anything else. The magazine holds 5 7.9mm metal bolts, which appear to be constantly kept at superheated temperatures before being fired. These bolts appear to fragment upon being ejected from the weapon, creating a scatter-shot effect reminiscent of human shotguns. Like all Jiralhanae weapons, the Mauler is equipped with a small blade underneath, making it a formidable melee weapon. The Mauler first saw use during the Battle of Gbraakon on Doisac, shortly after the Jiralhanae's global war. After that, it became the favored weapon of Jiralhanae security forces, and would not be seen by humans until the Battle of Earth. While a single Mauler is not as powerful as the UNSC M90 Shotgun by itself, the Mauler is still a lethal weapon up close. One shot to a light-armored or non-armored target will result in an instant kill, and the blade on the bottom of the weapon makes it an effective melee weapon, a fact helped by the Mauler's impressively fast melee swing and recovery. When dual-wielded by a Spartan or Sangheili, the Mauler's power is doubled and will kill a heavily armored or shielded target in one shot if fired at the same time at close range. Using a single Mauler against a heavily-armored or shielded target is risky, but still results in a kill if the user fires off a shot and follows up with a quick melee attack. Firing two or three times in rapid succession could perhaps result in a kill. Also, as well as having a faster reload than a Shotgun thanks to its magazine, it has a faster fire rate which is particularly useful when dual-wielding. Lastly, the Mauler is the only close-range weapon that can be dual-wielded, so the user will not have to waste valuable seconds switching to another weapon. The Mauler is generally unable to inflict the one-hit kill damage that the M90 Shotgun and later M45 shotguns and Z-180 Scattershot are capable of, unless dual wielded. The spread of the Mauler's shell severely limits its range, and any weapon that can be used outside of close range can take down a user with a Mauler. Ammunition is often rare to come by, and its five shell magazine can be used up rather quickly. The Mauler design and mechanics were modeled after the pre-Xbox Halo weapon, the Excavator, which was a piece of UNSC equipment that was shelved. It does appear that the mechanics behind the Mauler is reminiscent to the WST-M Shotguns from Marathon, as the principle is the same; a single shotgun will pack just enough punch to damage an enemy at range, however when dual wielded they become very powerful. The Mauler is not included in the Halo 3 Manual. The original Covenant Mauler appeared in the pre-Xbox version of Halo: Combat Evolved. It is referred to by the Bungie employees as the 'boring device'. In Halo Online's files and possibly Halo 3's files, the Mauler is referred to as the "excavator". The Mauler was originally thought to be the name of the Brute Chopper in the early stages of Halo 3's development. Due to the loss of dual-wielding capabilities, the Mauler is more powerful in Halo 3: ODST. While the Mauler only has 5 shots per drum before having to reload, the in-game model seems to indicate that the drum has a capacity of 9. Early concept art of the Brute Mauler, from the Art of Halo 3. An early render of the Mauler in Halo 3. An angled view of the Mauler. An in-game left profile view of the Brute Mauler in Halo 3. First-person view of the Mauler in Halo 3. A model of the Mauler for Halo Online. The Rear view of the Mauler featured in Halo Online. A basic Mauler on Diamondback. The golden Power variant of the Mauler on Diamondback.